Retired--Now What? : Dry Your Hands! In last Friday’s blog post, Wash Your Hands!, I stopped before drying them. Sorry. OK, you’re in a public restroom and you’ve washed your hands carefully. (Thank you.) Should you dry your hands? If you have a choice between paper towels and a power air dryer, which should you use? Decisions, decisions--paper towel or air dryer? 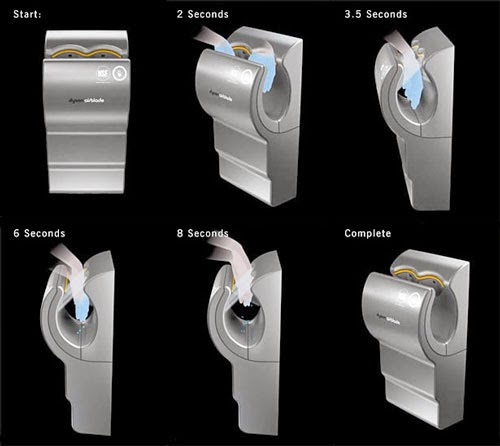 You’ll be elated to know there’s been research on drying hands. There are multiple reasons why you should dry your hands--things like chapping and dripping on everything. Considering hand drying from a health standpoint, the University of California Berkeley Wellness Letter summed up the consensus a few years ago, noting that drying reduces bacteria and that wet hands are more likely to transfer bacteria. While there’s no dispute about the value of drying, earlier research differed on the method of drying that was most effective for reducing bacteria, paper towels or power air dryers. Relax, you no longer have to stand there, staring at the wall if you’re offered a choice. New research has resolved the debate. Sort of. In a 2013 study published last month, researchers from the U.K.’s University of Leeds compared the spread of test bacteria from paper towels, warm-air dryers and jet-air dryers. To simulate drying of poorly washed hands, they coated hands with lactobacilli--the kind of bacteria you might find in yogurt--and collected 120 air-samples (60 test, 60 control) in close proximity and 1 meter from each of the three drying processes. Separately, they also coated hands with paint to visualize droplet dispersal. The up-close bacterial counts from the jet-air dryer were 4.5-fold higher than those from the warm-air dryer and 27-fold higher than those from paper towels. The results at 1 meter showed the same pattern. The jet-air dryer also produced the greatest droplet dispersal in the visualization tests. Score one for paper towels. Actually, that’s more than one. Two years earlier, the Mayo Clinic Proceedings published a literature review by collaborating researchers from Australia and China that also gave the nod to paper towels over air dryers for a trifecta: drying efficiently, removing bacteria effectively and causing less restroom contamination. But wait. In an as yet unpublished study reported in a press release last June, researchers at the University of Buffalo collected bacteria samples in 4 restrooms in 2 academic buildings. Each restroom had both a high-speed air drier and paper towel dispenser. They found six times more bacteria on paper-towel dispenser handles than on the air dryer. Expanding beyond the hygiene, the researchers also did a life-cycle assessment of the two methods--essentially a cradle-to-grave environmental tally--and an economic comparison. They found the high-speed air dryer would produce 42% less carbon dioxide and begin costing less than paper towels after 4.5 years of use. All this for hand drying? You bet. There’s big money there, which isn’t to disparage the research, even studies with corporate sponsorship (see Research Sponsor Bias). In 2011, MIT did a life-cycle assessment--not a hygiene assessment--comparing 4 types of power air dryers and 3 types of paper towels. The work was commissioned by the company whose high-speed dryer was found best. Another high-speed dryer company then sued, claiming incorrect data were analyzed for its system. Whew! So where are we? Well, dry your hands after washing. Beyond that, research to date suggests that you should use paper towels if a hands-in high-speed dryer (e.g., Dyson Airblade™) isn’t available. The high-speed, hands-in type was tops in the University of Buffalo study and in both life-cycle assessments. 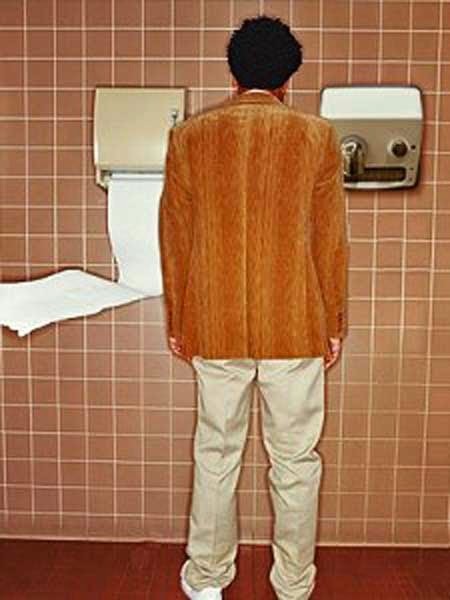 The hands-under warm-air and high-speed dryers might do better than paper towels in a life-cycle assessment, especially if compared to an electric paper towel dispenser, but not for hygiene. Whatever you do, be sure to wash and dry. Thanks for stopping by.